John 3:16 For God so loved the world, that he gave his only Son, that everyone who believes in him may have eternal life. Romans 8:37-39 No, in all these things we conquer overwhelmingly through him who loved us, For I am convinced that neither death, nor life, nor angels, nor principalities, nor present things, nor future things, nor powers, nor height, nor depth, nor any other creature will be able to separate us from the love of God in, Christ Jesus our Lord. Galatians 2:20 I have been crucified with Christ, yet I live, no longer I, but Christ lives in me; insofar as I now live in the flesh, I live by faith in the Son of god who has loved me and given himself up for me. 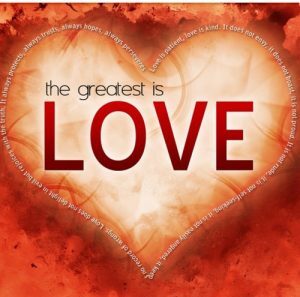 1 John 3:1 See what love the Father has bestowed on us that we may be called children of God. Yet so we are. The reason the world does not know us is that it did not know him.